COLUMBIA, Mo 11/19/15 (Op Ed) -- Checked your snail mail today? 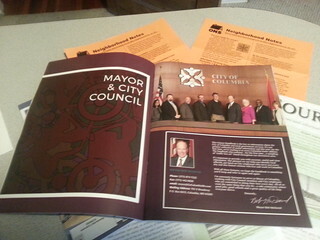 There's a good chance you have more paperwork from Columbia city government, now featuring a high-gloss magazine (Citizen Handbook, left). City Hall's paperwork jungle has residents asking, How can Columbia the Sustainable afford such extravagance? And what happened to the "sustainable" part? Crying poverty every year, the City of Columbia has raised utility rates annually since city manager Mike Matthes took office in 2011. From park use to parking, dozens of city fees have doubled or even tripled under the Matthes administration, which claims City Hall is broke, convincing voters to go along, as they did with a recent stormwater fee increase. Property managers pay almost 300% more in city inspection and certification fees, costs they pass along as rent increases. But if city government is so impoverished it has to hit residents with such high bills, how can it afford to send out mountains of paper every month, the piece-de-resistance that mass-mailed 56-page glossy magazine that raised hackles the minute it hit mailboxes? Little more than an expensive marketing gimmick for the one entity in cent ral Missouri that doesn't need more marketing, the Matthes-inspired magazine lovingly covers every city department, city service, and policy-makers such as the Columbia City Council. Chapters devoted to "volunteering" and "donations" encourage citizens to give even more of their valuable time and resources to a government notorious for lip service to citizen commissions and initiatives. 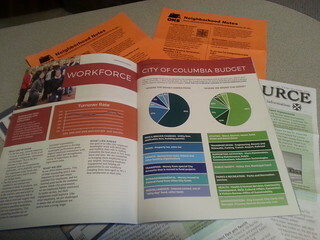 The "Sister Cities," "Living in Columbia," and "Columbia History" chapters sound good, but focus more on marketing ("Save money and be more comfortable with Columbia Water and Light's many energy efficiency programs") and scolding ("Residents are limited to two garage sales per year....") than living. 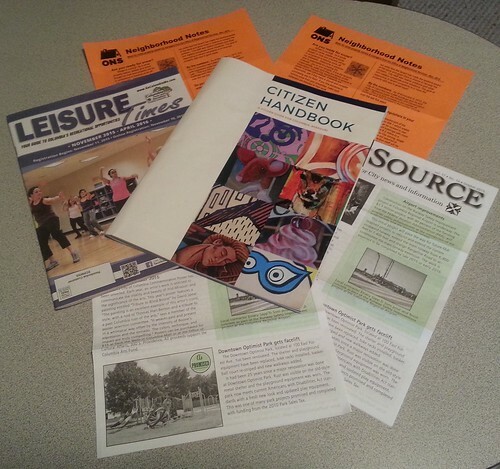 As if the glossy city thingy weren't enough, city government mails the City Source flier every month; the 50-page Leisure Times a few times yearly; and Neighborhood Notes with every communication from the Office of Neighborhood Services. If you have more than one utility bill or form letter coming to the same address, you'll get these brochures and magazines in dupli cate, triplicate, quadruplicate, and so on. Columbia prides itself as a high-tech, sustainable college town. Residents should be able to opt-in or opt-out of all the mailings, with digital alternatives on Facebook, Twitter, Instant Message, or via email. The city's sustainability director, Barbara Buffaloe, could take the lead on such an initiative. The deluge of paperwork reminds of the Columbia Daily Tribune's free newspapers, an environmental menace that clogs storm drains and litters streets. But a Town Boss, Trib publisher Hank Waters, owns a big printing press and so the paperwork deluge continues.